Gallium, atomic no. : 31, symbol as Ga, weight at 69.723, ?is the only metal, except for mercury, caesium, and rubidium, which can be liquid near room temperatures; this makes possible its use in high-temperature thermometers. It has one of the longest liquid ranges of any metal and has a low vapour pressure even at high temperatures. and blue LEDS could be used in full-colour LED displays while white LEDs and blue laser devices became possible as well. Gallium Metal is the primary raw material for making semi-conductor materials such as gallium arsenide, gallium phosphide, gallium antimonide. 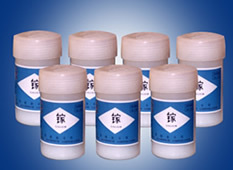 It can also be mixed with elements like germanium and silicon for producing semi-conductor, or used to make gallium oxide, gadolinium-gallium garnet as storage and memory components. your message or send an email to us, you will receive our prompt reply.